Strength, courage and skill, as well as technique, all play a part in the successful tackle. Tackling is the core skill of defending to regain the ball for one’s team. *Please be cautious with teaching slide tackling techniques at U12 and U14 age groups. Injury research shows injuries happen when the person initiating the tackle leaves their feet. To prevent injuries and protect the kids, players should stay on their feet. Maybe this technique should be taught at the U16 and older age groups and really elite level, but the masses need to stay on their feet. FIFA and the IFAB have given referees the authority to immediately eject players for illegal two footed, studs up slides. 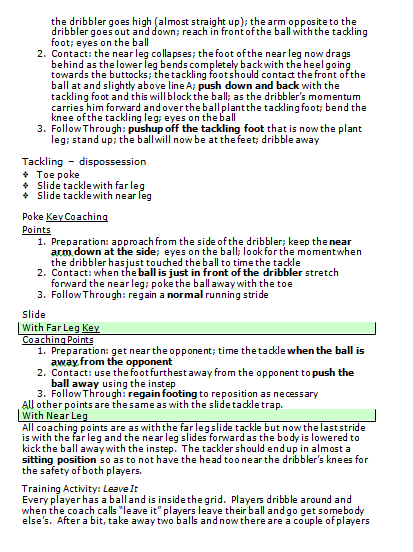 Follow Through: regain footing to reposition as necessary All other points are the same as with the slide tackle trap. All coaching points are as with the far leg slide tackle but now the last stride is with the far leg and the near leg slides forward as the body is lowered to kick the ball away with the instep. The tackler should end up in almost a sitting position so as to not have the head too near the dribbler’s knees for the safety of both players. Every player has a ball and is inside the grid. Players dribble around and when the coach calls “leave it” players leave their ball and go get somebody else’s. After a bit, take away two balls and now there are a couple of players without a ball. When the coach says “leave it”, players leave their ball and get someone else’s, but two players will now challenge other players for possession of a ball. 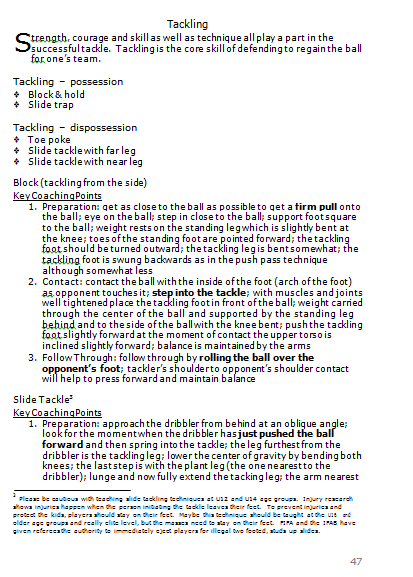 Tackling for possession situations are now created. Any ball that goes out of bounds for any reason is out of play and now more battles for possession will take place. 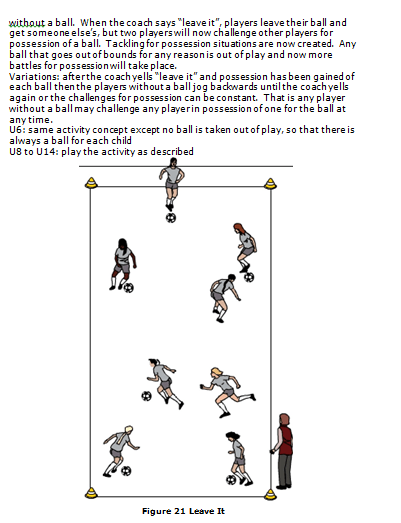 Variations: after the coach yells “leave it” and possession has been gained of each ball then the players without a ball jog backwards until the coach yells again or the challenges for possession can be constant. That is any player without a ball may challenge any player in possession of one for the ball at any time.